Being a pet parent is not easy, but in India, this challenge is experienced at a whole new level. Reason being, there is hardly any centralized system in the country on which people can rely for all sorts of pet care products & services. 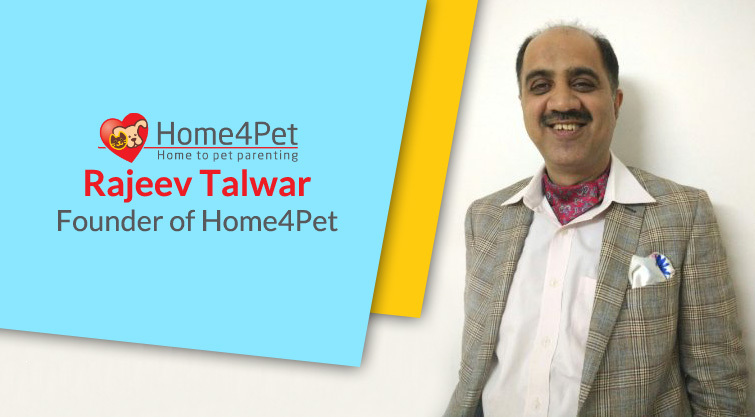 Rajeev Talwar, along with some fellow pet lovers, realized this gap, and came up with Home4Pet – an online platform that provide pet parents with a wide spectrum of pet care products & service with the help of local pet care services in Delhi NCR area. Growing every day, Home4Pet is a one-stop place for pet lovers to find all that they need for a better care of their pets. In next 3 years, Rajeev wants his startup to cater pet lovers of other metro cities as well, and later to expand Home4Pet to a global level. A very Eureka kind of thought became the foundation to start building Home4pet.com. The three of us (founders) are sworn animal lovers and realized early on that there was a huge vacuum in the market when it came to pet services, while there were myriad options to buy grooming products and pet food online; there was no single platform which took care of all pet needs under one umbrella. Perseverance, thy name is success. The most arduous task was to find the right people who offer these services with the same relentlessly undying passion and have operations in India. We travelled the length and breadth of the city to speak with these people and educate them about our concept. 3 months and we were able to convince the first set of providers that would be on board. They were hesitant but we asked them to have faith in us and in our concept. The unadulterated conviction in our concept and vision was impactful on our partners. We adjust sails time and again with ” We shall overcome” jingle in our heads when navigating our course. We have bootstrapped from our savings until now. Facebook, Twitter, Google plus, & Pinterest – all are good to reach target audience. Our next phase of expansion would be to tap into other metro cities. Additionally, work is underway for a pet fitness application on android. Making our presence felt globally too is being discussed with the right channels. Be more serious with an eye for detail.